Prevention is better than cure and this life-saving gift can immunise one dog against rabies and stop the disease from being passed from animal to animal or animal to human. Mayhew International vaccination programme delivers thousands of rabies vaccines each year to street dogs around the world, maintaining a healthy dog population and creating safer communities. 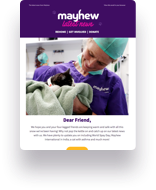 This gift supports our Mayhew International projects.